The Salento countryside is the backdrop to the Masseria Muntibianchi, which rises with its white walls amidst great stretches of olive groves, just 5 minutes from the historic centre and the coast of Otranto. 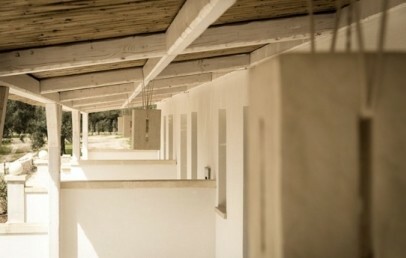 Recently constructed but in traditional style, the Masseria Muntibianchi is a fascinating structure with white stone walls, from which guests can admire the surrounding countryside. Constant search for quality marks the management of this welcoming agri-resort, which offers guests impeccable service and charming areas for relaxation, suited to every season, from the reserved pool set in the courtyard, to the reading room with fireplace for cosy winter evenings. 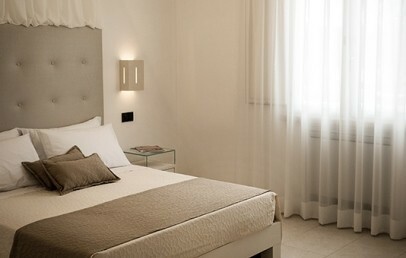 Reserved and stylish, the structure’s 20 rooms are marked by soft pale colours and stylish minimalist furnishings. Some rooms have a fully equipped veranda and small private garden. 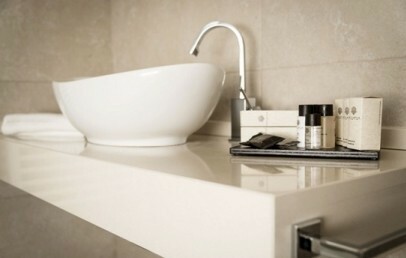 All rooms have an en-suite bath with shower and other comforts such as free Wi-Fi, AC and heating, 32” satellite TV, safe, mini-bar, hairdryer and line of courtesy cosmetics. 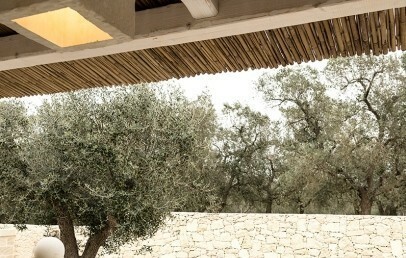 At the restaurant of the Masseria it offers the possibility to dine à la carte or take the half board for € 30 per adult, to pay on site, drinks excluded from 8 to 11 pm. Children up to 12 years are charged according consumption. The cost of your stay includes a welcoming cocktail, pool towels, push-bikes, vehicle parking area with surveillance and use of the pool and internal and external relaxation areas. The pool-side bar serves a light lunch based on local products and a selection of drinks. Free Wi-Fi connection is available in the common-use areas and all rooms. Payment of a supplement ensures a baby-sitting service, hairdresser, beauty treatments, massages and transfer to and from the airports, stations or town centres. Reserved and welcoming, these rooms are marked by their soft colours and simple but stylish furnishings. 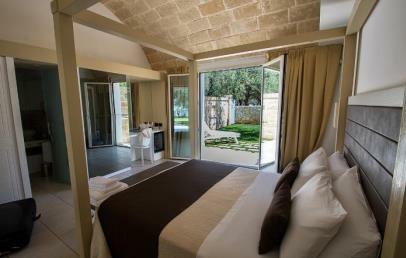 All the Superior rooms have a canopied bed and some also have a veranda and small private garden. The typical vaulted ceiling in Lecce stone marks these Deluxe rooms – a simple linear style with soft, relaxing colour schemes. These rooms have a private external entry and face on to the courtyard with an equipped veranda with chairs and coffee table. Large and welcoming, the Junior Suites consist of a bedroom with canopied bed and a living room area with a relaxation area and divan bed. All suites look out on to the courtyard and have a fully-equipped veranda and a small private garden. The typical vaulted ceiling in Lecce stone marks these Garden Deluxe rooms – a simple linear style with soft, relaxing colour schemes. These rooms have a private external entry and face on to the courtyard with an equipped veranda with chairs and coffee table. 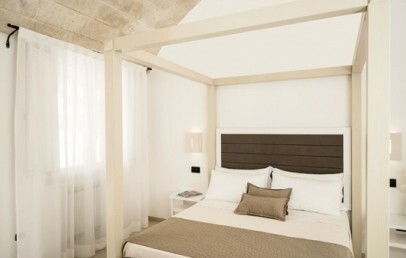 The rooms have a private garden of about 60 sq.m., equipped with sunbeds. Unique room typology with a Jacuzzi set in the garden. The furnishing is in a simple linear style with soft colour schemes. This Junior Deluxe room has a private external entry that leads into the private garden, equipped with sun loungers. 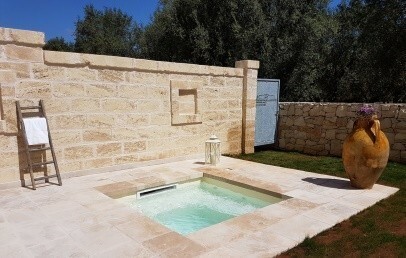 An ideal solution for everyone looking for privacy, well-beeing and pure relax. 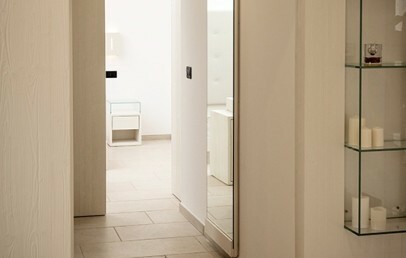 New and extremely elegant Suite with large spaces that allow to fully enjoy. The Suite is composed of a unique open space room with a typical barrel ceiling. The bathroom is spacious and has a whirlpool tub and a shower. The outdoor area is the jewel of this Suite, a large and well-kept garden with a heated pool (max. 30 degrees) to enjoy moments of complete relaxation in privacy.